The HighLift™ empties from a raised position at the flip of a switch. It has a maximum vertical emptying height of 72 inches, allowing operators to empty clippings and debris into an elevated space, such as a pickup bed or trailer. 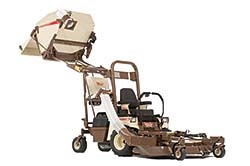 The rear-mounted collector and deck-mounted Quik-D-Tach® vacuum retain the mower's zero-turn maneuverability. The vacuum picks up debris without the need for an auxiliary engine and requires no tools for removal. The collector has a 15-foot capacity and a tapered bottom that compacts debris for continued productivity and fewer stops.